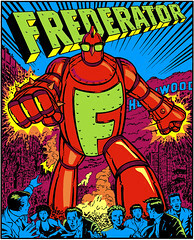 The Frederator Studios Blog: Heaven for MLaaTR Fans! HEAVEN FOR MLAATR FANS! 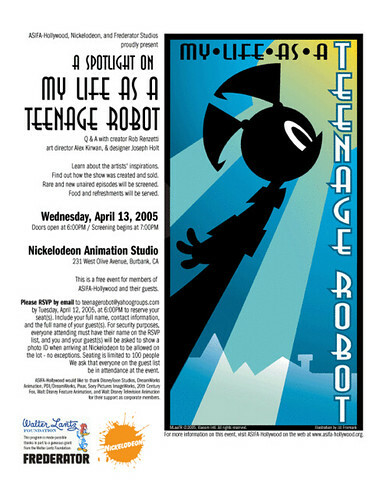 In one month, [MLaaTR creator] Rob [Renzetti], [art director] Alex [Kirwan], and [background desginer] Joseph [Holt] will host a panel here at Nick [in Burbank, California] all about Teenage Robot. See unaired episodes! Ask bizarre questions! Eat free food! For more info, go to the ASIFA-Hollywood website. See you there! I've seen this on "Teenage Roblog." I am thinking about going there. I love to meet some of the crew who work for the making of MLAATR!